Pepper Trail is one place that the experience of the great outdoors matches up to the amazing stay — where else can you live in a luxury tree house and ride in a rustic coracle. 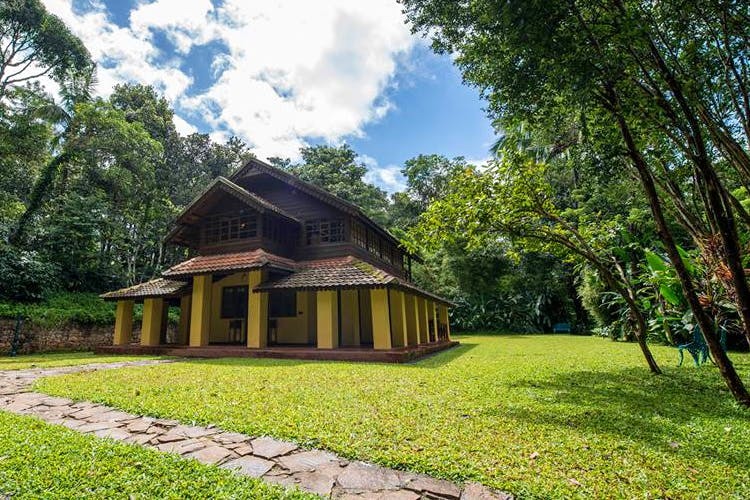 Hidden under the canopy of the Mangalam Carp Estate which is a spice and coffee plantation deep in the Western Ghats of Kerala, this resort, is more homestay and less hotel. With one Kerala-style bungalow dominating the lodging space, you’ll be walking into the past as you step in here. But while the structure is classic and most of the interiors are too, modern accents will keep you in the present. We love the wooden beams, walls and flooring that give the place a warm and cosy feel. After all, it is over 140-years-old! Yes, yes, it’s got creaking floors too! You can check into two suites in this main house — Mackenzie or Malabar, for that regal ambience. Think low beams, four-poster beds, en suite bathroom bigger than most city flats, and of course, tables and walls holding memories and heirlooms of Balram Kurup, and his descendants who currently look after the property. It truly is as if you walked into your grandma’s home — everything spotless and in its place. But alas, you mention a tree house to us, and we’ll be up there in a trice, no matter how extraordinary the suites. And the ones at Pepper Trail are luxury-meet-earthy. Aptly called Hornbill and Woodpecker, both are nestled up in the jackfruit trees and at least 40 metres above the ground. These have large bedrooms, four-poster beds and a bathroom, but they also have space inside and outside to just relax amidst nature. You don’t have to even come down to Earth! When you do descend though, there’s much to explore — beyond those tranquil plantation walks and trails. The estate is so vast it even has a one-acre waterbody that you can float across on a coracle. Or, hit up the herb garden to see what is grown and help on the plantations too. It’s really quite fulfilling — farm to fork! And that too authentic Kerala food. This is the life folks, this is the life! They also have an Ayurvedic spa to massage away your aches and pains.